Michael McFadyen's Scuba Diving - Middle Arch, Poor Knights, NZ Despite the fact that there are numerous arches at the Poor Knights Islands, the names of some are so obvious that it would be very easy to figure out which one is being referred to in the case of dive sites like Middle Arch. 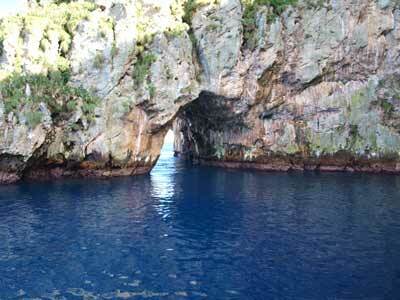 As can be imagined, this arch is in the middle of the northern island, Tawhiti Rahi. 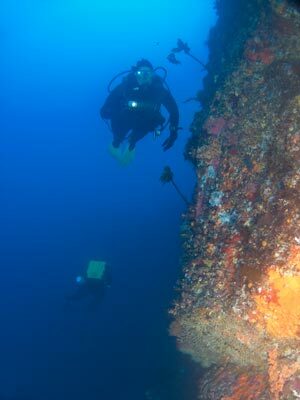 It is on the more protected western side of the island so is diveable at most times. Half way along the island you will see an archway that is much wider than some of the others. It is located on a ridge that comes south from the island and the arch runs east-west. If approaching from the south close to the island you will not see it till you are within a few hundred metres as the opening will be to seaward of you. A GPS of S35º 27' 28.1" E174º 43' 58.4" (using WGS84 as a datum) will put you in the small bay right off the entrance to the arch. 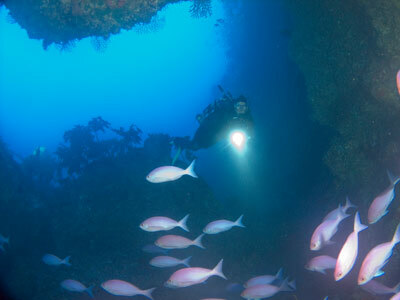 This arch is very visible from here and the dive plan easily understood. The bottom in this area is about 27 metres or so. From the boat, descend and swim north over to the wall. Once on the wall, follow it to the west. You will see the entrance to the arch, but leave that for later, there is more to examine first. Continue to drop as you go, down to about 25 metres at least. If you follow the rocky reef to the south you will picvk up the wall and start to go around the base of the arch's support. Your heading will change to west. 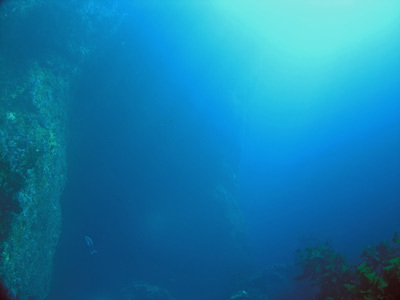 The reef bottom gradually gets deeper, to at least 35 metres. 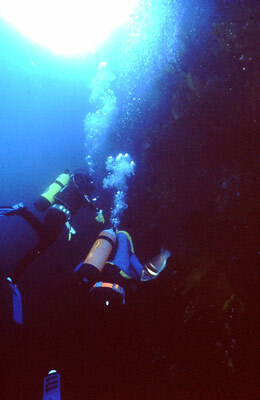 The bottom off the reef wall is sand with some boulders while the wall is vertical with some kelp and sponges. 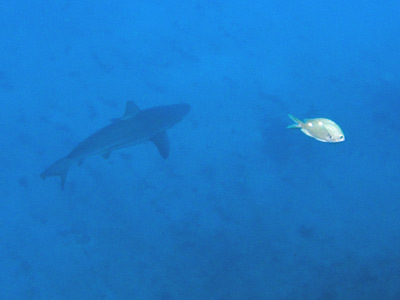 When I dived here in March 2011we saw a large bronze whaler shark in this area. It patrolled along the wall for three to four minutes. If you go past 30 metres, start coming back up before you turn around. There is a lot of fishlife in this area, kingfish and snapper mostly. We also saw a few bullrays. There is also an overhang and a large boulder that creates a gutter between it and the wall. This has a lot of fishlife. After about 15 minutes turn around and come back at a shallower depth. You need to aim to be at about 16 metres when you start heading north again. 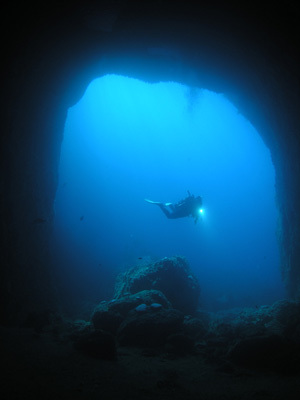 If you are coming along at this depth, you will see the entrance to a large cave. This is called Bernies Cave. It extends about 25 metres into the arch's support and is perhaps 20 metres wide and 10 metres high at the front. The bottom is sand till about half way back when there is a ledge. This is a few metres or so higher than the sand. 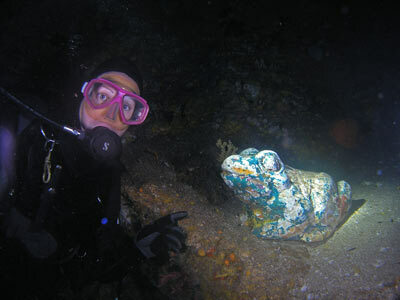 On the ledge is a concrete or porcelain frog, a quite large specimen. At the back of the cave is an air bubble and towards the front, another larger one. 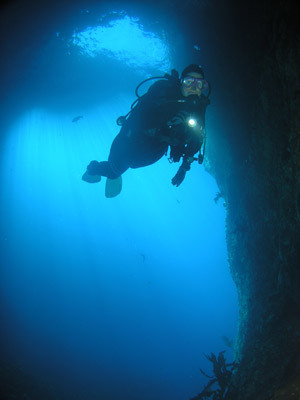 This is the most interesting one, as you can get some great mirrored photographs of divers as they enter the cave if you plan it right. You can also surface in the bubble The entrance is normally full of thousands of small fish. Once you are finished here, head back out of the cave and follow the wall around to the left. You might want to drop a bit deeper to get some good views of the arch as you approach it. 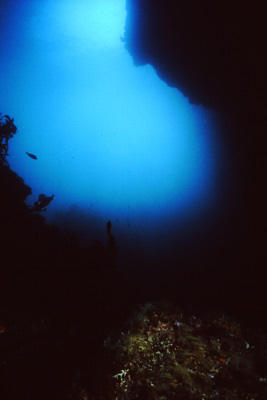 From a sandy 27 metres, the reef gradually rises over a bottom of medium sized boulders to 18 metres straight below the start of the arch. It then rises further to 10 metres on the western side of the arch. Spend some time here as the fishlife can be amazing. Inside the arch there are lots of pink maomao and some snapper. There are also quite a few eels of a number of species. We also saw some nudibranchs. You can spend a lot of time here. If you did a second dive here you could head out to the west a little before coming back to the eastern side of the arch. Once you have spent enough time in the arch, head over to the northern side of the arch and follow it to the east. This will bring you out onto the wall to the north of the boat. There are also some nice eels to be seen along this wall. 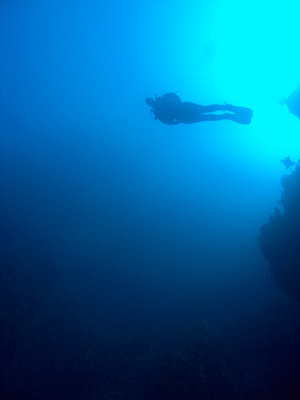 Once you are almost finished, you can ascend to five metres and do your safety stop on the wall before swimming back across at five metres to the boat. You should be able to see the boat if you swim off the wall a little. When we did this dive in March 2011 there were thousands of small pink jellyfish in the bay when we returned to the boat. These were being eaten by the snapper which would first hit them on the bell so that they retracted their tentacles, and then eat them. Birds were also swooping in, but I am not sure if they were eating them. 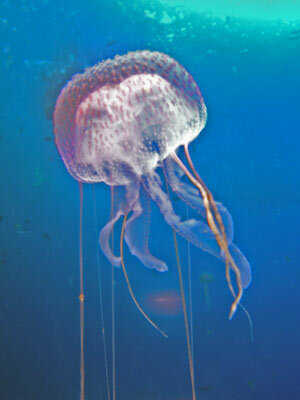 The jellyfish packed a medium level sting. 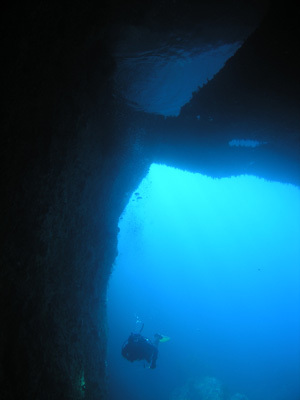 Middle Arch is another magical dive site at the Poor Knights, up there with the best of them. 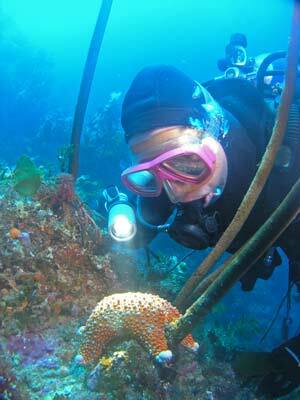 It is also once of the best reef dives I have done anywhere in the world. 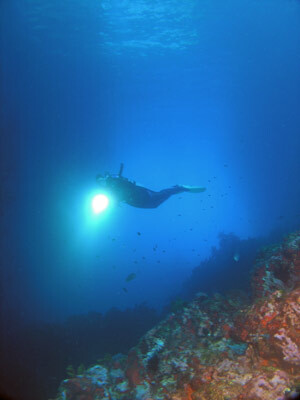 While there are hundreds of dive sites at the Poor Knights, this is one that is worth doing many times. When we dived here we had 40 metre visibility on the southern side of the arch's base and in the arch and 30 metres elsewhere. The water temperature was a lovely 21ºC. 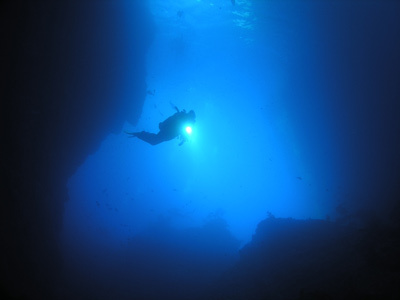 A must do dive at the Poor Knights. The following are three photographs I took at Middle Arch in April 1992. 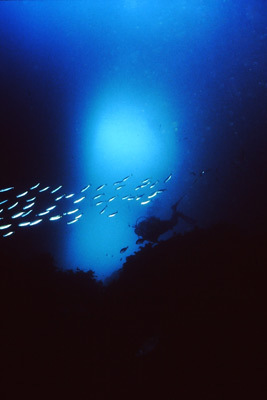 They were taken on Ektachrome slide film with a Nikonos IV and scanned to digital in January 2011.